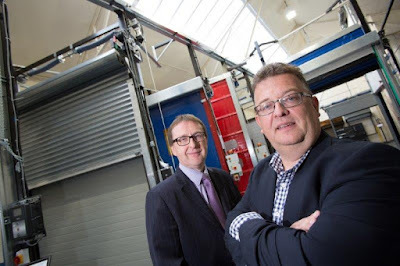 A long-established manufacturer of industrial doors and hardware components, Indupart Ltd, is enjoying additional premises at Discovery Park in Stockport thanks to a six figure investment from long term banking partner Royal Bank of Scotland. The new 28,000 sq feet warehouse, situated near Indupart’s head office, provides an independent manufacturing workshop and houses a range of newly installed high spec machinery. This is helping to speed up the efficiency of supplying the industrial doors to trade across the UK to help keep ahead of the European competition. The existing building will house the components part of the business where existing equipment in place will be utilised. The new premises has created eight new jobs on the shop floor, adding to the company’s 42 employees. In addition, Indupart has depots in Hemel Hempstead, Glasgow and Bristol to logistically serve the UK trade and speed up the supply of goods required. “We are delighted to announce our expansion plans in our thirtieth year of business, which is testament to our business continuing to grow and improve in this competitive industry.